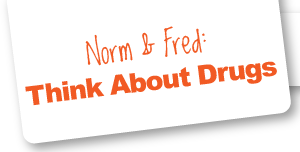 "Think about Drugs" is a life skill presentation designed to help today's youth make healthy choices. Our program offers an in depth look at drugs, their use and the lifestyle associated with their usage. We call this the world of drugs. "Think about Drugs" takes the audience on a journey into the shadows of the drug world... a dark place where friends, family and decision making is influenced by substances. Our goal is simple: to get people thinking. We don't preach. We don't lecture. We merely lay out the facts. We show that you cannot solve problems by using substances....and accordng to our audiences we do it better than anyone else. © Norm & Fred: Think About Drugs 2010 - Developed by Triware Technologies Inc.